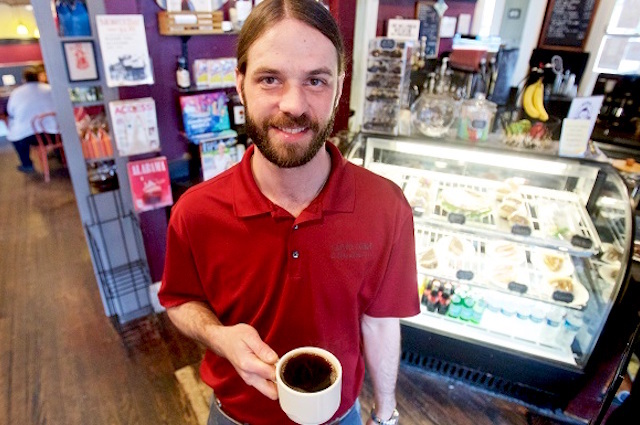 Alan Tolson was in college when he became a barista at Carpe Diem Coffee & Tea Co. in Mobile, Alabama. He worked part time while going to school at the University of South Alabama, making minimum wage plus tips. Now, 17 years later, he’s the proud owner of the shop. So, how did he go from being a barista to a coffee shop owner? After working as a barista, Tolson became a shift manager, then a coffee roaster. After that, the shop’s former owner made him a salaried employee and put him in charge of managing the shop’s wholesale coffee business. He tracked down and secured new clients, filled orders and made sure everyone got their coffee on time. That perseverance paid off. In 2013 when the shop’s owner decided to retire, she asked Tolson if he wanted to buy the shop. Tolson said the business makes a profit and has seen double-digit percentage revenue growth in each of the last three years. Carpe Diem was also named the best coffeehouse in Mobile for the second straight year by readers of Mobile’s weekly newspaper. “While I would describe the overall flow as steady throughout the day, you can count on a line out the door for the morning rush, after school time and all weekend mornings,” he said. Though he wouldn’t share how much money he makes today as the shop’s owner, Tolson said he still pays himself the salary he earned as a coffee roaster. Instead of giving himself a raise, he chose to reinvest the profits into improving the business and paying down the debt he incurred when he bought it. “This decision is based on my belief that investing in the betterment of the business and our employees will return benefits down the road,” he said. Tolson was upfront about the challenges of being a business owner. Some owners are able to keep the lights on, while others aren’t, he said. “Business owners are the last to get paid, after all other payroll, taxes, inventory costs, overhead, etc.,” he said. The trick to any successful business is to know it inside and out, according to Jim Hilson, co-owner of Saxbys Coffee in Georgetown, a Washington, D.C. neighborhood. “I’m able to manage Saxbys because I spent two years learning to be a barista, serve customers, run the cash register and lead other employees,” Hilson wrote in The Hoya, Georgetown University’s student newspaper. Hilson was a barista earning minimum wage at Saxbys Coffee during his junior and senior years of college. Four years after graduating from Georgetown, Hilson and his friends Eric Rodawig and Ken Martin bought the shop. Another key to his success was partnering with people who had diverse strengths. His two business partners are experts in accounting, budgeting and business management, he explained. “Together we’ve formed a team with the right collective knowledge to operate a coffee shop successfully,” Hilson wrote. Hilson highlights one more key ingredient: passion. “I enjoy pouring every coffee I pour, slicing every bagel I slice and becoming friendly with every coworker and customer that I meet; that’s what keeps me happy to keep putting my time, energy and focus into Saxbys,” he wrote. Hilson wouldn’t say how much money he makes today as one of the co-owners of the shop, but he described the business as a “total success,” plus he gets to work in an environment that he loves. “I’m grateful I did choose to come back to the cafe I knew and the community of Georgetown,” he said in an interview. The shop is busiest in the spring and fall, when it’s not as hot in D.C. as it is during the summer months. Because the shop is located near Georgetown University and several other schools, it also tends to do better when school is in session, Hilson said. Tulsa Sturmey began working at Second Cup Coffee Co. in Prince George, British Columbia, 19 years ago when she was just 21. She worked her way up from being a barista making $6 an hour, what she called a “coffee agent,” to becoming the shop manager. She had only intended to work at Second Cup until she found a job in the tourism industry, which is what she went to school for. But at the time — in the late 1990s — no one was hiring in Prince George and she had a hard time finding work. “After a while I stopped looking because I actually liked what I was doing, so why leave?” she said. Eventually she had the chance to buy a Second Cup franchise, and in November, she became a coffee shop owner. Since then, she’s renovated the business and is trying to bring new faces through the door. Her current salary is around $60,000 per year. Guests keep coming back to Second Cup because they like the friendly baristas and delicious coffee. Roughly three-fourths of all daily sales are from regular customers, Sturmey said. “What makes us popular against Starbucks and Tim Hortons is our customer service,” Sturmey said. Sturmey said she jumped at the chance to buy the coffee shop because she wanted to be her own boss and because she didn’t want anyone else to buy it — after working at Second Cup for so long, she felt invested. Sturmey said her employees are the key to her success as a business owner. Without them, people wouldn’t keep coming back to Second Cup. Though she knows several successful coffee shop owners who’ve never worked as baristas, Sturmey believes working her way from the bottom to the top has helped shape her into a better business owner. Your Turn: Do you think there’s a benefit to working in a business before you own it?